Katherine Jenkins gears up for marathon! 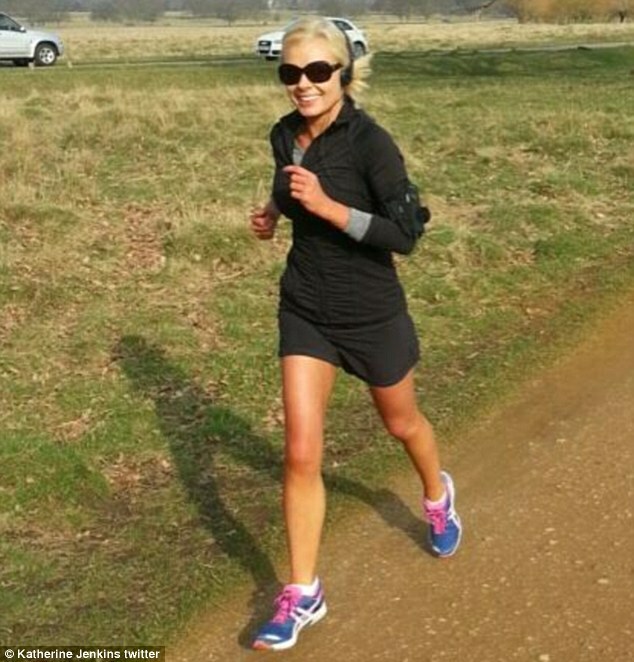 Opera singer Katherine Jenkins has hit another bump in the road as she prepares for this year’s London Marathon. The 32-year-old has found herself coming under fire from Twitter trolls, who have ‘slated’ her as she trains for the charity run. Taking to Twitter on Wednesday the Welsh star expressed her frustration at what has become quite the uphill battle, after losing her training kit just a few days earlier. It seems that Katherine was the victim of abuse after she demanded a charity donation from an airline after they lost her marathon training kit. While many people applauded her turning the situation into a way to raise more money for her charity, some heartless Twitter users were less than impressed with her request. One wrote: ‘Come on gal, are you that desperate to get a headline?’ While another commented: ‘Wishes Katherine Jenkins would sit down and shut up for a while, she really is a tiresome example of womanhood.’ Despite the unnecessary abuse the hard working star hasn’t let it get the better of her and has continued her training as per usual. As well as training to run the 26 miles, she is also currently taking part in a European tour with Il Divo. It was on a flight home from a concert on Sunday that her luggage, which contained her tour costumes and gym kit, got lost. Being separated from her gym gear after arriving back in London from Berlin, meant Katherine could not do her intended 18 mile run on Sunday night. With just five weeks to go before the 26 mile run, it’s vital that Katherine keeps up her long-distance training. She tweeted on Sunday: ‘Thank you @Lufthansa_DE for sabotaging my intended 18mile marathon training run 2day by losing my luggage..Hope u’ll be sponsoring me now!’ When it still failed to materialise on Monday, she tweeted again: ‘New day & still no sign of our lost luggage or a donation 2my marathon charity page from @Lufthansa_DE http://www.justgiving.com/KatherineandHannah … #Gesture RT.’ The airline fortunately managed to get it back to her later that day. The singer will be running on April 21 with the aim of raising £5,000 for Macmillan Cancer Support, who cared for her late father Selwyn when he was battling cancer.